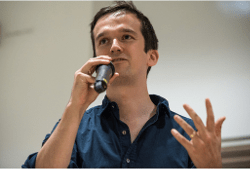 The OpenStreetMap GB project aims to measure and improve the quality of OSM data in Great Britain, cleaning it up to get rid of silly little data errors, and to make this cleaned up version available in formats that local and central government types are used to. I have been exploring whether I could use the Web Features Service as an easier source for landuse data (see my previous blogs on making a map of London’s green spaces and analysing Southwark’s landuse, which both required a somewhat complicated process to get the data set). In the process I’ve found it’s actually a great way to identify gaps and problems in our data. Browse around the map on the OpenStreetMap homepage and you might think we have an impressive coverage of residential landuse, playing fields and parks. But probe around with the WFS and you can spot all sorts of missing data. The red circle in this image highlights a likely gap in our data. The yellow blocks are all the different land covers – residential, retail, park, forest, school, etc. The area underlying it in blue is the extent of the SE21 postal code. So if blue is poking it means OpenStreetMap hasn’t got any object covering that land area, which could mean we’re missing something that is actually there. In this particular area, Dulwich in inner London, it’s pretty unlikely that any bit of land can’t be tagged as something – brownfield, grass, nasty disused area of asphalt! What could that gap be? 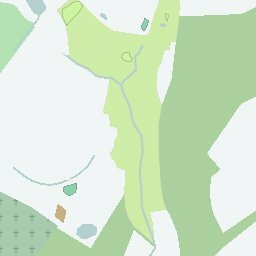 I went to check it out and found it was an incompletely mapped recreation ground, so I updated OpenStreetMap to fill the gap. Don’t see it? That blue corridor coming from the north west into the red circle is a railway line. It divides up two yellow blocks (a residential area to the west and a park to the east). Then it runs into a big yellow block – a residential area that should really be split in two, leaving a corridor for the railway line. Again, it was easy to correct the data in OpenStreetMap. The best thing about the OSM-GB WFS is that it’s updated daily, so I can gradually improve the data by checking back the next day and spotting something else to fix. I’m using QGIS, and setting the style property by category, categorising by the ‘boundary’ column and setting any boundary types to transparent. This stops boundary polygons obscuring all the other data. In this way I can quickly set the style to highlight anything I like, and save the data as a shapefile which I can then query to get something more sophisticated. I’m currently following this method to get a really good dataset for the SE21 area, just to see what’s possible. Though some OSMers argue that we shouldn’t have so much landuse, I find it interesting stuff. I did some work on producing tiles with just landuse. Can you navigate or orientate yourself by just looking at landuse maps? Thanks, and interesting question. I can think of a lot of places where landuse would actually be a lot more useful than road names and where road names might even be unnecessary, i.e. where knowing you need to turn left at the wood then carry on to the pond half way down a road. Perhaps something for an orienteering club to try out? I can’t ever understand why some people argue that we shouldn’t map certain things. Surely the whole point of OpenStreetMap is that people can map what they find useful, within certain rules such as it needing to exist on the ground? The only time I get annoyed is when people replace simple data models with really complex ones that don’t suit the level of detail we can achieve in OpenStreetMap, e.g. removing sidewalk tags and trying to map pavements as pedestrian areas.